Keeping ancient healing traditions alive!! In traditional indigenous communities, healing ceremonies were performed openly with communal participation. Supporting the healing of one another is truly a “community responsibility” as each one of us is essential for the proper functioning and wholeness of the community itself. Within the shared environment, Shamans are the lead healers, but the energy and support of the common group is known to be the essential ingredient to the wellbeing of all. With this understanding, and in functioning within The Center Pole mission statement, “keeping ancient healing traditions alive”, I am offering my 40 years of experience in shamanism to perform healing ceremonies within communal settings for the benefit of all sentient beings! All the ceremonies described below can be performed at any consenting location including outdoors (weather permitting), homes, offices, yoga and healing centers, churches etc. There are only two prerequisites: That the space must be quiet but allow for us to generate sound. Each participate must be free of drugs and alcohol and open to the success of the healing ritual. A Phukne Healing is a unique form of ancient Shamanic Spiritual Healing. 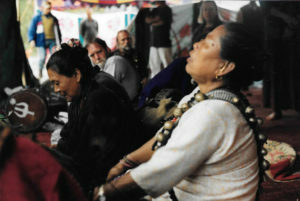 Popular in South Asia (India, Nepal, Tibet), Phukne Healings are performed by a Shaman (Jhankri, Bombo) who aligns with and channels their most powerful deity/spirit through a practice known as shamanic merging or “becoming”. The shaman then transfers, by blowing into the energy field and pathways of the recipient, the appropriate mantras (spiritual words of specific power and energy) to harmonize, heal and restore power to the four bodies: spiritual, mental, emotional and physical. Phukne Healings are performed in groups, — among family members, friends, or groups that have formed around like-minded endeavors. Those individuals within the group wishing a healing approach the Shaman, one at a time, to tell of their concerns. Once merged with the helping deity, the Shaman is empowered to perform divinations in which they perceive beyond the ordinary and sees the spiritual/subtle energies at the source of disharmony within the recipient’s energy field..
During this ceremony, the Shaman uses many ritual tools and activities to help increase the power and magnitude of the healing energies and will call upon many Deities, including those spirits manifesting as the planets (Graha’s) for their healing help. Each Phukne offered within the group usually takes approximately 10 minutes. Extraction Healing, many times accompanied by a Soul Retrieval, is a shamanic practice that has been performed for thousands of years throughout the world. The community is called on for support with focused chanting, drumming, singing, rattling and lending their intention, focus and power to the healing ceremony. Healing work is simple; it involves removing something intrusive that doesn’t belong in an individual’s energy field and/or reconnecting power/energy that has been found to be disintegrated. Energetic balance is the sought-after result for health and wellbeing. 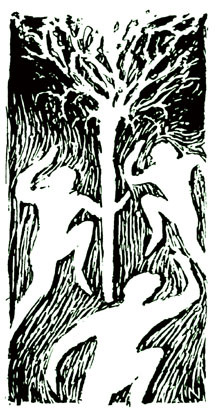 In extraction healing, the shaman will spiritually pull (extract) any intrusive energy from the subtle body of the individual using ritualistic extraction tools. They will also blow empowering mantras, protective spirits and/or severed “soul parts” (power) into an individual which have been found to have detached from an individual’s field during periods of trauma, causing them to be dis-spirited, weakened and ill.
For life threatening Illnesses, addictions and confusion. Power Healing is a specialized healing ritual for those in serious, life-threatening conditions, addictions and those that feel lost. Together, with loving family members and friends, the shaman leads a ritual to Raise Spiritual Power for the benefit of the inflicted. We ask for mercy and even miracles through the power of the earth, sky, Gods/Goddesses, and to whomever the inflicted pray, to come “right here, right now”, to perform this healing. With all of this powerful energy focused at one point, within the heart, mind and body of the suffering brother or sister, we can feel assured that the right course will be taken by their personal spirit to follow its soul path, in form or without, for ultimately, God rules all. This healing is for all beings; to alter what is available in Life toward healing, love and compassion, and to accept that which has been set by the stars before birth. But most importantly, it is for the inflicted; for their opportunity to hold onto faith in the world, the community, the family, themselves and the God within. With this depth of FAITH, miracles can and do occur. Several years ago, I took part in a very special evening ritual held by Sandra Ingerman, a well-known Shamaness from New Mexico. The purpose was to prove that, through intention and faith in the spiritual practice, polluted substances, like water, could be made pure again. The results were perceivable and measurable, and proved to me beyond the shadow of a doubt, that spiritual work was not only uplifting to the heart and the soul, but also absolutely practical on every level of existence, including physical. In Nepal, whenever land is cleared for growing crops, or a house is to be built, ritual is performed first to appease the earth spirits that already live there. We must realize that everything is alive and is spirited and many of our actions disrupt the balance of nature. As the Earth is dispirited, so will be her “peoples”. Because of our past ignorance’s, it is we who are responsible to return to those injured places in nature where harm has been done to heal the earth, to call back and re-spirit the Earth, for health and wellbeing of all. Therefore, purifying rituals are essential wherever harm or disruption and its ramifications exist. Our soil, plants, water, air, sky, insects and animal being — the very substances that make up our very bodies and emotions — are being attacked, weakened and made incapable of providing the support that we, as humans, depend on for our lives and our continued evolution. I will conduct the original “Water Purification” ritual as demonstrated to me by Sandra for those who want to witness this result so they can then go forth to help re-purify the earth. If you have ever had tried on someone else’s clothing, you may have felt their energy throughout the fabric, sometimes comfortable, sometimes not. Likewise, when we enter physical structures, we can feel very directly if the energies are attuned to our own purposes or not. Energy and or spirits cling to structures as well as people and this could have positive or negative influences and results in our endeavors. If we are entering a new venture, life style, or new home, office or other physical space, it is important that the energies and spirits of the building are supportive and cooperative and not contrary. It is also essentially important to set “your vision” for the dwelling and to share a clean projection with the surrounding spheres to maximize the potential to attain your goal or purpose. Family disruption is the vast norm in our society. If we have any hope of changing the condition for future generations, we are all called to begin now, within ourselves — to do the work that helps us pierce through our inherent delusions and to shed the “interior pollutions” of mind, emotion and spirit that have been passed down through the generations of our family lineages. Family dysfunction continues until someone stops it by doing something totally different and more wholesome than the family norm. As the Native Americans believe that our actions of today must not harm the future seven generations. This ritual is meant to help create the bridge to personal freedom which can help lead us all to the true life of love, compassion, power.